BILLINGS, Mont. -- A Minnesota man who carved the names of himself and his wife near the 1806 signature of explorer William Clark on a national monument in Montana has agreed to pay $4,400 in restitution and fines, the Bureau of Land Management said Monday. 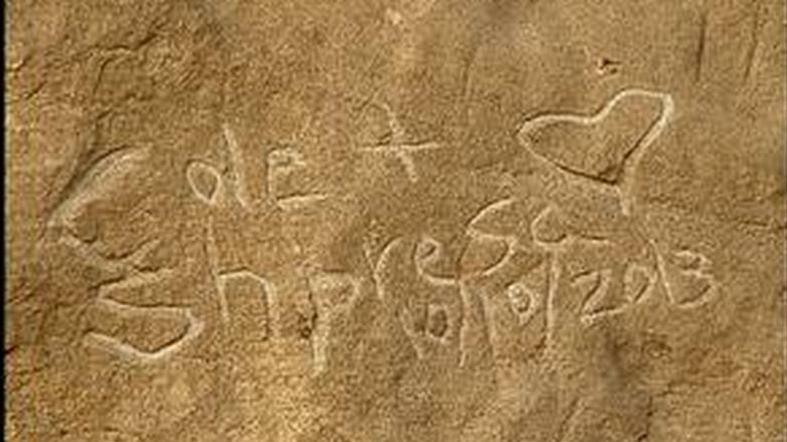 The fine came after the U.S. attorney's office filed a misdemeanor vandalism charge against Cole Randall of Plymouth, Minn., for the carving in sandstone at Pompey's Pillar that reads "Cole + Shpresa 10/10/2013." The carving also included a heart. Randall agreed to pay $3,400 in restitution and a $1,000 fine to settle the case. The BLM said the restoration work in southeastern Montana is expected to occur in May. "We are hopeful that some of the damage to our historic treasure will be fixed," monument manager Jeff Kitchens said in a statement. "However, the carving by Mr. Randall was so deep and severe that we are limited in what can be done." Randall's carving - made just a few feet to the left of the "W. Clark" signature made in July 1806 - also impacted other, more faded historical signatures, some of which were over 100 years old, Kitchens said. Randall has said he made the carving after his wife discovered a lump in her breast during their honeymoon. He said he was inspired during their stop at the monument by a description that said generations of Americans passing by had left their marks on the rocks, and that he decided to leave the couple's name in case anything happened to her. He had to climb over a railing to make the carving. Randall apologized in an email to the BLM and media outlets in November. "I regret my decision and ... I humbly apologize to the people of Montana and to every American who was affected by my foolishness," Randall wrote. "I hope you can find it in your heart to forgive me for this and realize that I understand the gravity of my mistake." According to CBS affiliate KTVQ, the couple from Minnesota is the folk singing group "Flora Cash."